I found this delicious green bean recipe on thearmeniankitchen.com while doing a search for Middle Eastern Recipes. We had just returned from Papa John's Farm Stand with fresh green beans, and since I always have ground lamb in the freezer I thought I'd give it a try. Fassoulia is an easy to make recipe that calls for no exotic ingredients. I chose to use ground lamb, because I had some in the freezer, but you can use beef or turkey. I used chicken stock in the recipe because I had some, but you can use water. I didn't have diced tomatoes but I had a can of whole tomatoes that I chopped. It's a great "one-pot" meal (I cooked everything in a Dutch oven). I cooked it the day before, let it cool and then refrigerated it in the Dutch oven. I warmed it the next day on the stove top and served it with some freshly baked bread. My husband, who is an Englishman, insists that lamb must be "cooked as a roast and served with mint jelly". I was very surprised when after eating this he said "you can make this again". That's his stamp of approval. 1. In a nonstick skillet, brown meat for about 10 minutes, stirring frequently. Drain any excess fat. Place meat in a bowl & set aside. 2. Using the same skillet, saute the onions in olive oil until soft and slightly brown. 3. Return the meat to the skillet with the onions. Add salt, pepper, allspice, basil, oregano, and garlic. Cover & cook 10 more minutes. 4. In a large pot, add the green beans. 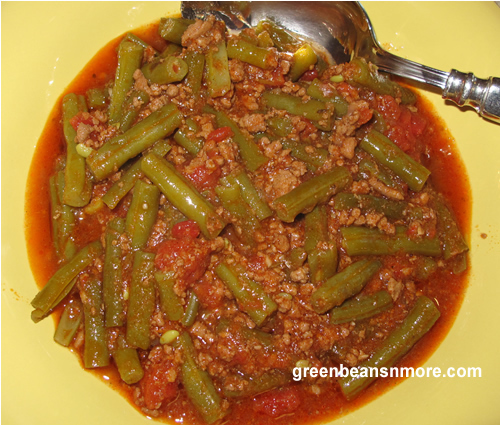 Pour the canned tomatoes, and the diluted tomato paste over the green beans; stir. 5. Add the meat mixture to the green beans. Mix together. 6. Bring to a gentle boil, then cover and simmer for 1 hour, or until beans are tender. Add a little more water or stock, as needed. 7. Serve with rice or bulgur pilaf. SPECIAL NOTE: The Fassoulia tastes even better the next day, after the flavors have a chance to intensify. Oh yes, a loaf of crusty bread goes great with this, too! NOTE: If making this without meat, this dish can be served cold or at room temperature.